Our new Liftoff! Mark IV sewing table has a variable height from 31 7/8" to 49 7/8", a travel of 18" and 4 memories you can set for a touch of a button ease. A fixed position opening of 29" by 14", you can set up your new Luminaire™, Solaris™ or Designer Epic™ machine for flatbed sewing or set it on top with included blank insert and support for doing embroidery. Tool depression, magnetic pin holder, large full extension drawer with a cover board to extend work surface included, drawer dividers. Includes one cut insert when ordered with the table. Dimensions 60.5" wide by 27" deep leaf down (37" deep with leaf up) by 31 7/8" to 49 7/8" high. Drawer storage is 21" wide by 17.5" deep by 2.5 height. Drawer cover board 23"x16"
US Warranty 5 Years on Defects in Materials and Workmanship. 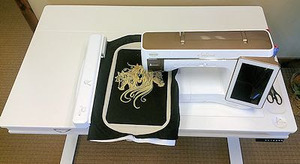 Can't stand SITTING while you sew or embroider? It's time to take a STAND with the Liftoff! Mark IV. Our new Liftoff! 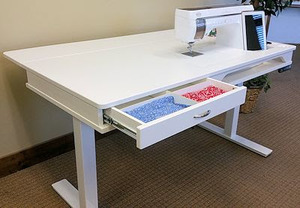 Mark IV sewing table has a variable height from 31 7/8" to 49 7/8", a travel of 18" and 4 memories you can set for a touch of a button ease. A fixed position opening of 29" by 14", you can set up your new Luminaire™, Solaris™ or Designer Epic™ machine for flatbed sewing or set it on top with included blank insert and support for doing embroidery. Tool depression, magnetic pin holder, large full extension drawer with a cover board to extend work surface included (a $65 value), drawer dividers. Includes one cut insert when ordered with the table, a $43 value! Dimensions 60.5" wide by 27" deep leaf down (37" deep with leaf up) by 31 7/8" to 49 7/8" high. Drawer storage is 21" wide by 17.5" deep by 2.5 height. Drawer cover board 23"x16". Assembly of the legs and leaf required. Ships as three (3) boxes.